Sunday, January 22, 2012, 12:00–2:00 p.m. Admission: Free; no reservations required. Free parking is available on Jefferson below the park. Additional free parking will be available in a lot at 3540 Hayden Avenue, Culver City 90232. 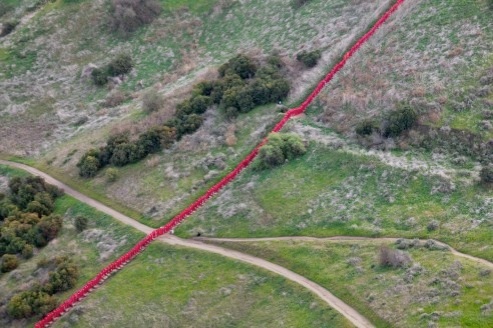 Lita Albuquerque’s Spine of the Earth 2012, performed in the hills above Culver City at the Baldwin Hills Scenic Overlook, will offer a striking large-scale performance in the fissure of the landscape. Often visible from the I-10 and I-405 freeways, the Overlook has views from downtown to the ocean, setting the stage for a dramatic re-interpretation of Albuquerque’s original 1980 Mojave Desert earthwork Spine of the Earth. For Spine of the Earth 2012 the pigment from the original piece will be represented by 500 performers. Be sure to arrive early so not to miss the skydiver who kicks off the performance! Please plan to arrive by 11:30 a.m. to allow time for parking. The performance starts promptly at noon. If you are interested in participating as a performer in this historic performance, please sign up at spineoftheearth2012.com.